Liverpool were the highest spending club in the top flight, paying £43m to agents between 1 February 2018 and 31 January 2019. Chelsea (£26m) and Manchester City (£24m) were the next biggest spenders. Championship clubs spent more than £50m while Sunderland accounted for more than 50% of League One's £5.5m outlay. Fees to agents went up despite spending on transfers falling by more than £500m when compared with the previous season. The Football Supporters' Federation said that fans will find the spending "shocking" and called for even more transparency in how the money was spent. A spokesman said: "Many will find the volume of money going out of the game shocking - particularly at a time when many lower league clubs are in serious financial difficulty. "Though supporters back the right for players to have representatives that look after their interests, they struggle to understand the justification for some of these astronomical fees seen today. Greater transparency and accountability is needed." Liverpool spent £27m on agents in 2017-18 to conclude deals for players including Virgil van Dijk and Mohamed Salah, and their 2018-19 expenditure covers a period in which they have invested heavily to compete for the Premier League title. Brazil midfielder Fabinho (£39m) arrived from Monaco, while his international team-mate Alisson cost a then world record £66.8m fee for a goalkeeper after being signed from Roma. The Reds also spent around £50m on Naby Keita, and Switzerland midfielder Xherdan Shaqiri joined from Stoke for a fee of £13m. Championship clubs paid out a combined £50m, around £8m more than a year ago. Former Premier League clubs Stoke, Swansea and West Brom - who were all relegated in 2017-18 - contributed 35% of the divisional total. Overall, English football spent around £318m on agents, which represents a £60m increase from one year ago. But spending on transfers was significantly down. 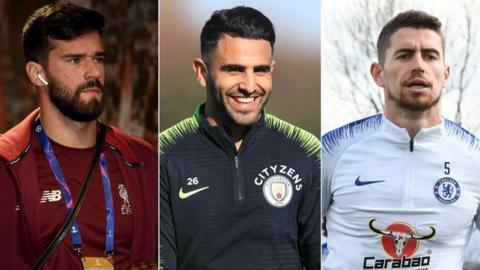 Across the summer 2018 and January 2019 transfer windows combined, Premier League clubs spent an estimated £1.4bn. That figure is the second highest for an entire season following a record spend of £1.9bn in 2017-18. The level of spending on agents in the English game has raised questions in the past as to whether that amount of money could be put to better use. In July 2018, Gary Neville suggested that a levy on agents' fees would be an effective way for the Football Association to fund grassroots football. The former England defender was giving evidence to a Digital, Culture, Media and Sport (DCMS) parliamentary hearing shortly after the FA had announced plans to sell Wembley Stadium for £600m to help pay for grassroots football improvements. Neville questioned the FA's logic at the time - calling the sale plans "ridiculous" and "a short-term plan we'll regret forever". The FA, in pressing the case for improvements to justify the proposed sale, said in 2018 that only one in three pitches at grassroots level were of adequate quality. Fulham owner Shahid Khan withdrew his £600m offer for the stadium last October. League One sides spent £5.5m, with Sunderland accounting for half of that total on their own. Expenditure on agents in League Two remained just below £1m at £940,555 with Northampton paying out more than any other club in the division, spending £92,125. Strugglers Macclesfield spent only £1,000 on agents, the lowest amount of any club across the top four divisions. In the National League, Salford paid out £76,338 to agents - more than eight clubs in League One and 21 clubs in League Two.